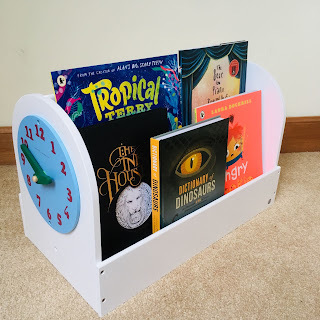 Over the past month we have teamed up with Smallprint Books and Tidy Books to bring you an awesome new series of children's book recommendations so that you can 'give the gift of reading' this Christmas on my social media but I thought it would also be good to have them all here on the blog so you can find them easily again when it comes to shopping! We've carefully selected, with the advice and help of children's book expert Jenny at Smallprint Books, 5 books that we thing are truly perfect for children of all ages, so I hope there was something for everyone (I've also got three age-categorized gift guides going up tomorrow so watch out for those!). This little cookie is very irritable indeed. Even your little readers' presence sets off his wrath. With each page turn he gets crosser and crossed with you. But as you seem absolutely intent on sticking around and continuing with his story, Cookie decides to let you in on why he is so cross. It turns out that nothing seems to have gone right for him today: he's heard the same terrible song on repeat, he used the wrong toothpaste, he got a bad haircut and the ice cream parlour let him down with none of his favourite goodies! Is there anything that can improve his day? Maybe you? When Cookie realises that you, the reader, are still standing by his side, he finds his clouds of anger lifting. I love this story, it makes me laugh out loud. It reminds me of the whims of toddlers, how the most insignificant things can ruin their whole day! A brilliantly unique book that is inventive and hilarious alongside vibrant illustrations, it's just such a perfect story for little ones. And wrapped up with a packet of cookies it would make the most delicious gift!! 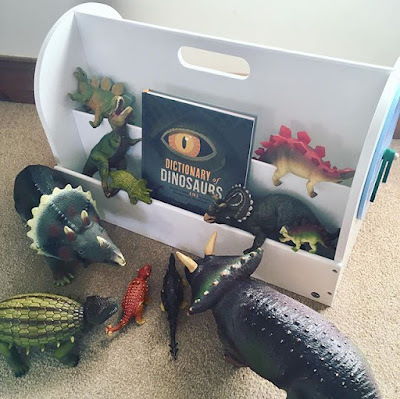 Do you know a dinosaur fan in need of the ultimate book on dinosaurs? For that's what this one is! Even these dinosaurs are crowded round with something to learn! In this 'Dictionary of Dinosaurs' you can find out about every dinosaur that's ever been discovered! Starting with the Aardonyx right up to the Zuniceratops, you can learn all about when they lived, where they lived, what they ate and much much more.Of course there are all the favourite dinosaurs in there too! BookBairn is a big fan of the Triceratops and I'm partial to the Diplodocus! The illustrations are superb in their graphic style making them appealing for younger ones but also cool enough for the older readers. And I love the little scales so that you can see how big these awesome creatures are. It's perfect for parents who need to swot up on the dinosaur knowledge to answer all those burning dino questions! (And has a pronunciation guide too - thank goodness!) The definitive guide of dinosaurs! Looking to #givethegiftofreading to a slightly older child and want to pick up something very special? Then Ink House is a perfect book for them! This is a drastically different picture book and is truly fascinating. It is aimed at readers 8+ and the detailed ink drawings create a world of magic. The Ink House is an artists mansion, built on a magical pool of ink that inspires creativity in all who live there from Mary Shelley the tortoise to Maestro the mouse. Such a wonderful cast of characters. And you are invited to the annual Ink House extravaganza! Beautifully crafted, these ink drawings are something to pore over and paired up with an ink pen, readers will no doubt be inspired to create ink drawings of their own, and will make a wonderful gift! How do you follow up a masterpiece story like The Bear and the Piano? By writing, and illustrating, a companion story about The Bear, the Piano and some new characters of course. This book doesn't centre on Bear though, instead focusing fiddle-playing Hector and his dog Hugo. When Hector retires, Hugo learns to play fiddle himself and is invited by world-famous piano playing Bear to travel the world and play in front of thousands of people. A dream come true, right? But it was Hector's unfulfilled dream, can he put his jealousy and sadness aside, swallow his pride and learn to be happy for Hugo? Maybe if he can, Hugo can help his dream come true too? This is such a heart-warming tale of friendship, finding your dreams, adventure and, of course, music! Beautifully illustrated, and set in a city that echos New Orleans, the scenes are as vibrant as the colourful cast of characters - particularly those animal musicians in Bear's Big Band, this is such an atmospheric book that will delight your young readers. And makes the perfect gift. Tropical Terry was an instant and firm favourite on BookBairn's shelf. And I'm sure it because it's one of the most colourful and fun stories about a seemingly dull little fish called Terry. He has a great little team of friends - Cilla the crab and Steve the sea snail and they play lots of fun games. But that are not part of the 'cool gang' that live in Coral Reef City. And Terry just wants to fit in with these glamourous fish. So he, with the help of his friends, creates the most spectacular tail fin out of all the bits and bobs he can find and becomes 'Tropical Terry'. However, he soon learns being the shiniest sparkliest fish in the sea can attract unwanted attention. Eddie the eel fancies a bite of Terry for his dinner. But fortunately, the games that Terry has been playing with his old friends have made him super skilled in evading Eddie’s unwanted advances! This is one of the most colourful books that we have on our shelf! It makes me smile just to look at the stunning illustrations. And it has a lovely message about being true to yourself, not judging a fish by his fins and accepting others. And some tips on how to avoid being eaten by an eel! We love it so much we even made our own Tropical Terry by finding bits and bobs from the craft box! This is a spectacular book and would make the perfect gift for little readers. We also love our new Tidy Books storage box - so much so that whilst I intended it to be for The Wee Page Turner's bedroom we have actually decided to keep it in the living room for now as we love having books at floor level for the littlest reader to grab easily. We call this #babyledreading! The box is sturdy, and portable (it's really easily to lift and move around but the board books we stash inside are really heavy so I tend to take some out first but we have moved it between the kitchen, living room and upstairs when it's not so loaded with books and it means I could move it easily when we put the Christmas tree up, for example, as it's in the same spot!). 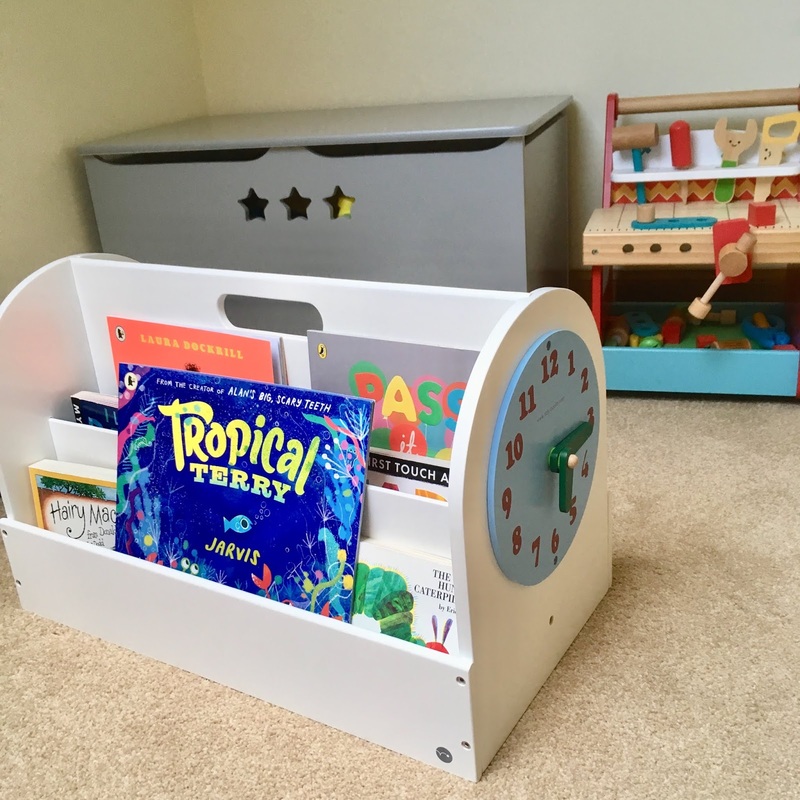 It was super-easy to build - took me about 15 mins one afternoon when the kids were on their iPad. 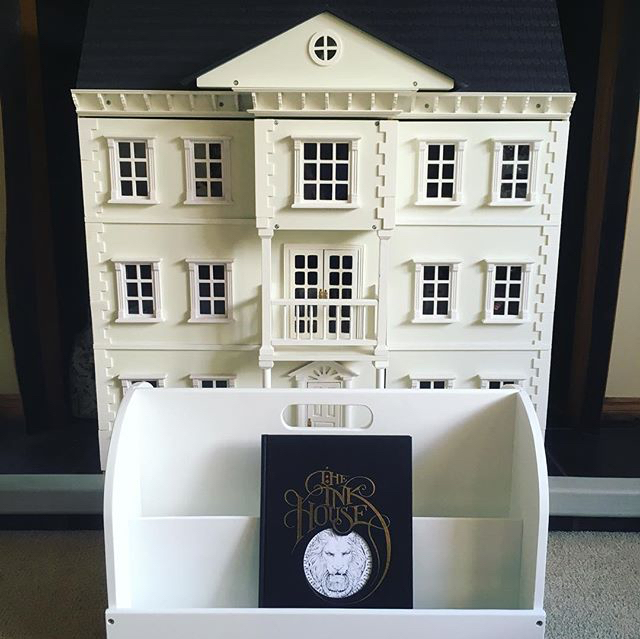 It's also really attractive and holds a bunch of books! We also like that the kids have a side each. And both BookBairn and The Wee Page Turner love to spin the clock. So there you have it! 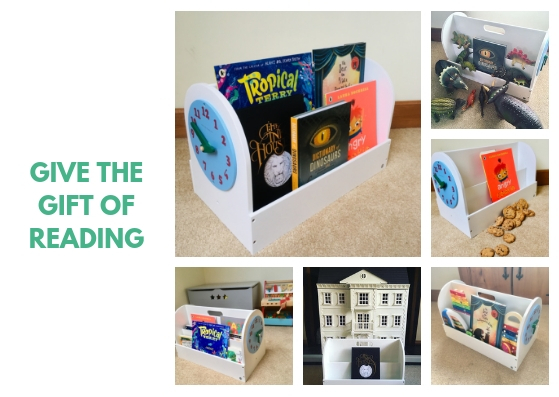 Five awesome books #givethegiftofreading this Christmas and a great book storage solution for those new books! And you can win them all!! And a Tidy Books Book Box to store them in!! The competition will be running across out Instagram and on Smallprint Books and Tidy Books accounts too so lots of opportunity to enter! And if you love the look of a Tidy Books shelf, they have kindly sent us a discount code to share with you for the duration of the competition so if you would like a book box of your own, or one of their many wonderful shelves just use BAIRN10 at checkout. What a wonderful way to fill those stocking at Christmas! 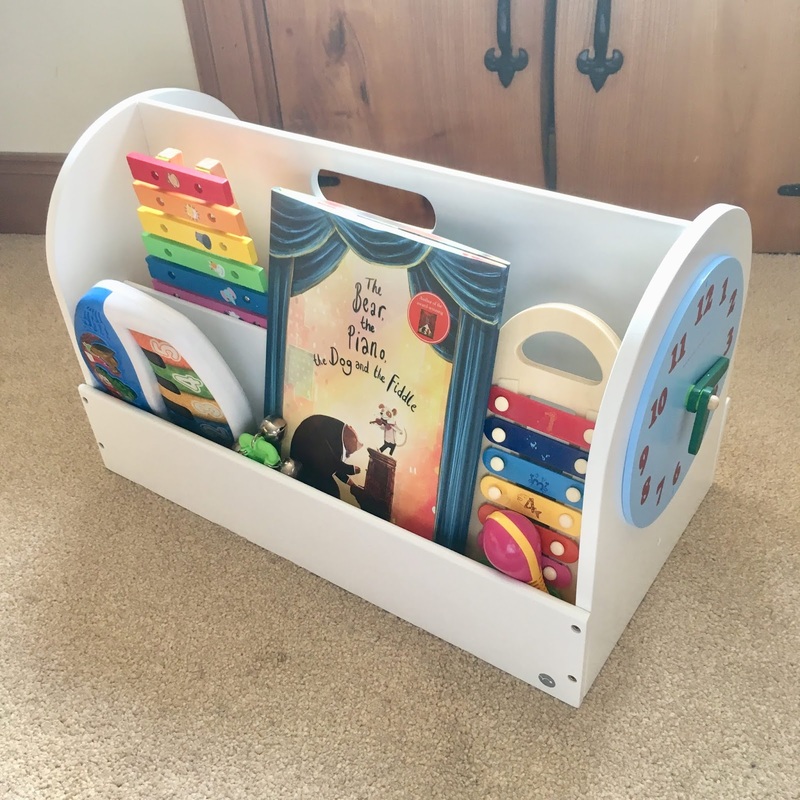 Disclaimer: I was sent the portable wooden book box by Tidy Books as part of the collaboration and the books for the competition will be supplied by Smallprint Books. The books that will feature in the competition are ones from our own collection. This looks like a great selection of books. 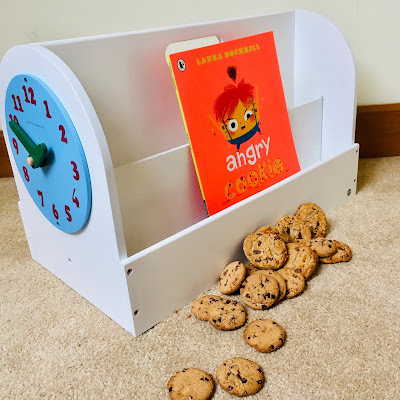 I particularly like the sound of Angry Cookie although I have to say that I wouldn’t restrict insignificant things ruining a whole day to toddlers...... a bad haircut will do it any day! Haha! Perhaps we are a bit more like that than we would like to admit!